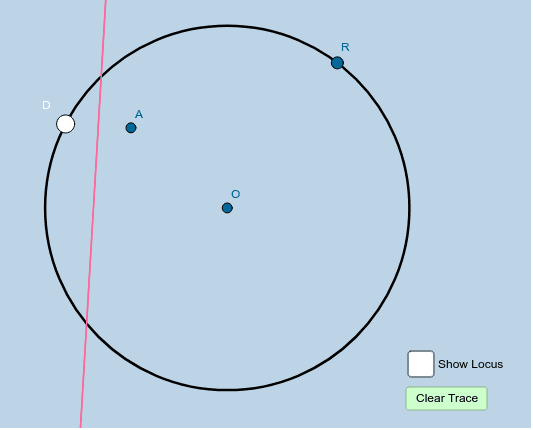 In the applet below, O is the center of the circle shown. Point D is a point that lies ON this circle. Point A is a point that ALWAYS LIES INSIDE the circle. (You can move it anywhere you'd like). The pink line is the perpendicular bisector of the segment with endpoints A and D. Drag point D around the circle a few times. What do you see? Describe in detail! Feel free to alter the locations of A and R. Then clear the trace and drag point D around again. Why does this occur? Please go to the Locus Construction 2 Task & begin!